I went to the Santa Monica Farmers Market this Wednesday to pick up a few loaves of super-fermented gluten-friendly sourdough bread from the Bezian bakery stand. This guy is amazing. He ages his sourdough culture for weeks and weeks until it breaks down all the wheat and makes it digestable for even gluten-intolances! AMAZEBALLS. I talked to him about 20 minutes because I told him I read his article in Whole Living and he wanted to educate me a bit and give me some tips, which were much appreciated. We held up the line a bit. 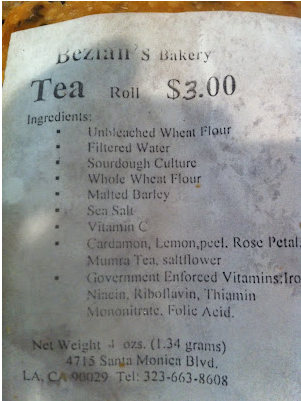 People were waiting to get their Bezian loaves. It was crazy. He told me to hook myself up to a blood pressure monitor and check myself before and 20 minutes after I eat something to tell if it bothers me. If my blood pressure goes up, don't eat it. Understood.